THP1-Dual™ KI-hSTING-M155 cells were generated from THP1-Dual™ KO-STING cells by knockin of the intronless coding sequence (from the ATG to the TGA) of the M155 hSTING variant. This mutation is associated with an upregulation of IFN production and a chronic autoinflammatory disease, known as STING-associated vasculopathy with onset in infancy (SAVI) [2-3]. THP1‑Dual™ KI-hSTING-M155 cells are resistant to blasticidin and Zeocin™. 1. Yi G. et al., 2013. Single nucleotide polymorphisms of human STING can affect innate immune response to cyclic dinucleotides. PLOS One. 8:e77846. 2. Liu Y. et al., 2014. Activated STING in a vascular and pulmonary syndrome. N Engl J Med. 371:507-18. 3. Jeremiah N. et al., 2013. Inherited STING-activating mutation underlies a familial inflammatory syndrome with lupus-like manifestations. J Clin Invest. 124:5516-20. THP1-Dual™ KI-hSTING-M155 cells were stimulated with 10 μg/ml of various cyclic dinucleotides (2’3’-cGAMP, 3’3’-cGAMP, 2’3’ c-di-AM(PS)2(Rp/Rp), cAIMP or cAIMP(PS)2Difluor(Rp/Sp), 30 μM BX795, 10 μM Brefeldin A, or 300 μg/ml Amlexanox. After overnight incubation, the IRF (panel a) and NF-κB(panel b) responses were determined using QUANTI‑Luc™ and QUANTI-Blue™ respectively. Bars represent the % activity on the signal in non-induced (NI) cells. Dose inhibition of constitutively activated THP1-Dual™ KI-hSTING-M155 reporter cellswith Amlexanox, Brefeldin A and BX795 inhibitors. 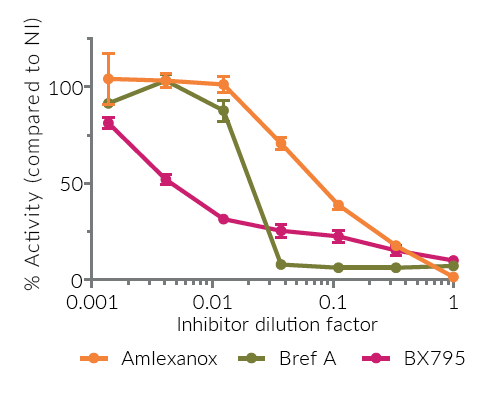 Starting concentrations of Amlexanox (300 μg/ml), Brefeldin A (10 μM), or BX795 (30 μM) were diluted in 3-fold series. After overnight incubation, the ISG response was determined using QUANTI‑Luc™. Data represent the % activity on the signal in non-induced (NI) cells without inhibitors. The knockin (KI) of the human STING variant (M155) has been verified by functional assays, PCR and sequencing. Reporter activity has been validated by stimulating the cells with STING ligands, such as c-di-AMP, cGAMP. The cell line stability for 20 passages following thawing has been verified. The cell line is guaranteed mycoplasma-free. 1 ml of Normocin™ (50 mg/ml). Normocin™ is a formulation of three antibiotics active against mycoplasmas, bacteria and fungi. • R232 (R71‑G230-R232-R293): the most prevalent in the human population (~60%). Referred as the “wild-type” or 232R-RGR allele . • HAQ (H71‑A230-R232-Q293): contains three non-synonymous single nucleotide substitutions; R71H, G230A and R293Q. This allele, found in ~20% of the population, is less sensitive to CDNs than the “wild-type” allele . • H232 (R71‑G230-H232-R293): the most commonly used hSTING variant in structural studies . • S154: a gain-of-function mutation resulting in constitutive STING activation . • M155: a gain-of-function mutation resulting in constitutive STING activation [3,4]. • A162: a synthetic mutation (S162A) that confers hSTING sensitivity to DMXAA, a tumor vascular disrupting agent in mice . THP1-Dual™ KI-STING cells are a family of reporter cells allowing the study of STING variation by monitoring the activation of the transcription factors ISRE (IFN-stimulated response elements) and NF-kB. They were generated from THP1-Dual™ KO-STING cells, which derive from the human THP-1 monocytes, by stable biallelic knockout of the endogenous HAQ hSTING gene and stable integration of two inducible secreted reporter genes: Lucia luciferase and SEAP (secreted embryonic alkaline phosphatase). The Lucia luciferase gene is under the control of an ISG54 (interferon-stimulated gene) minimal promoter in conjunction with five ISRE. 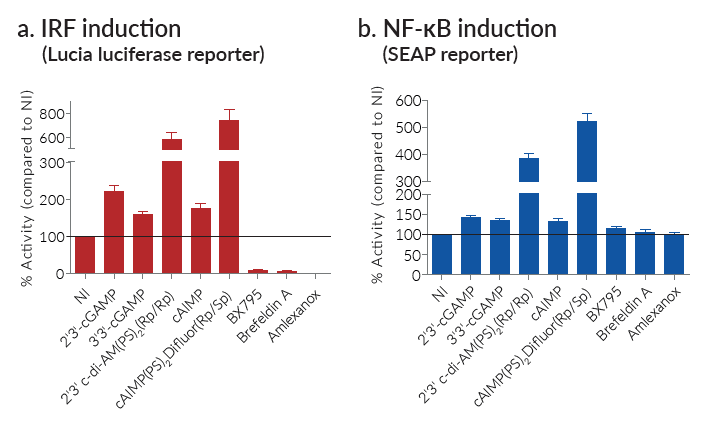 The SEAP gene is driven by an IFN-β minimal promoter fused to five copies of the NF-kB response element. As a result, they allow the simultaneous study of the IFN regulatory factor (IRF) and NF-kB pathways. Both reporter proteins are readily measurable in the cell culture supernatant when using QUANTI-Luc™, a Lucia™ detection reagent, and QUANTI-Blue™, a SEAP detection reagent. 2. Yi G. et al., 2013. Single nucleotide polymorphisms of human STING can affect innate immune response to cyclic dinucleotides. PLOS One. 8:e77846. 3. Liu Y. et al., 2014. Activated STING in a vascular and pulmonary syndrome. N Engl J Med. 371:507-18. 4. Jeremiah N. et al., 2013. Inherited STING-activating mutation underlies a familial inflammatory syndrome with lupus-like manifestations. J Clin Invest. 124:5516-20. 5. Gao P. et al., 2014. Binding-pocket and lid-region substitutions render human STING sensitive to the species-specific drug DMXAA. Cell Reports. 8:1668-76.